Who would you rather have in charge of Egypt? Hosni Mubarak, who was probably a strong-arm, even oppressive, president, but, was at least friendly to the West—or hard-core, radical, Muslim clerics like those who rule Iran, despise the West, and would like to see Israel destroyed? I know the answer the Israelis would give, as well as most intelligent and sensible Americans. All those Liberal pundits who cheered when Mubarak was forced to resign should have been a little more cautious about what they wished for. Sometimes, when you get what you want, it turns out to be very different than what you thought. Sometimes, it turns out to be far worse than what it replaced. The Egyptians should likewise be careful in what they wish for. They did their best to get rid of Mubarak, who was a quasi-dictator, but he also kept his people safe from terrorists, kept the peace with Israel, and allowed the Egyptian economy to grow under his watch. What did they get when they ousted him? More of the same. Nothing really changed, except the country is now mired in chaos and far more vulnerable to both terrorists and takeover by radical Muslims who, if given power, would turn Egypt into a Mediterranean version of a brutally oppressive Iran. That would make Mubarak’s regime look like a Sunday afternoon church picnic by comparison. At present, the only thing standing between the Egyptian civilians and that prospect is the army, who for now, do not look like they will allow an Iranian-style Muslim theocracy to take over the country. 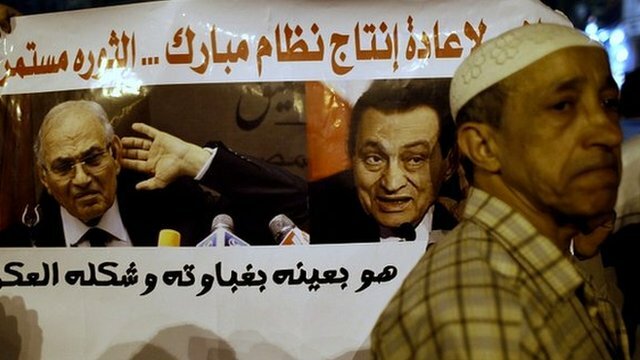 This should cause a huge sigh of relief for all the Liberal protestors who wanted so badly to be rid of Mubarak. If they thought things were bad under the former president, they clearly have no idea how bad it could be under an Iranian-inspired regime. The civilians might despise the Egyptian military, but those who truly value democracy and freedom should be thankful for the generals who run the show and are standing firm against the Muslim Brotherhood--as well as the even more radical elements that would destroy what little democracy and freedom is left in Egypt. Once again, we all need to be careful in what we wish for, you just might get it. The Russians wanted to get rid of the czars and they got Stalin. The Cubans wanted to get rid of Batista and got Castro. The Iranians wanted to get rid of the Shah, and look what they got. Hosni Mubarak might have been less than perfect, in fact, he might have actually been a pretty bad guy, but what replaces him could be far, far worse, not only for the Egyptians but also for the Israelis, the West, and the entire world.